The age old saying, “If it isn’t broken, then don’t fix it” Is alive and well today especially with the executives in the film studios that produce these paeans to iconic genres. The strict formula that they follow to produce these films can be easily traced back to older precedents that; if are not captured on celluloid then can surely be found within the pages of timeless stories, plays and dramas that may well have been devised since before the time of Christ. The structure which they follow has been so firmly established and often repeated to perfection that one must only piece together interesting or juxtaposing plot lines with interesting circumstances for the main and minor conflicts within the story and finally sprinkle some common parallels throughout the movie to give viewers something they can hold onto that’s it familiar to them. Then, with these “new” elements, simply place them into the archetype for whatever genre that is desired. 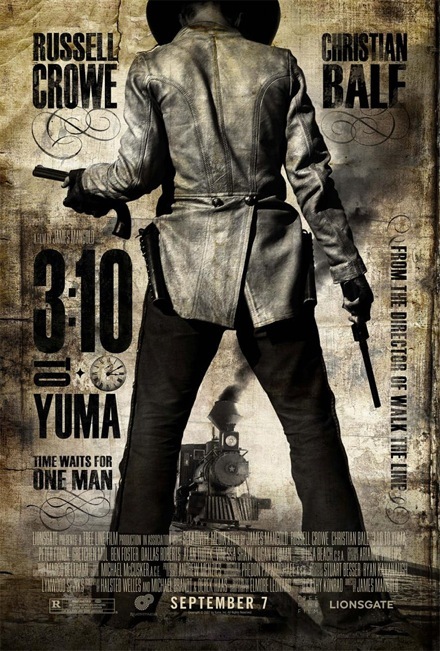 A solid film that we will be dissecting within the confines of this paper is the 2007 remake of the 1957 western, 3:10 to Yuma. Within the following paragraphs we will dissect the inner workings of this movie and find what parts are common to the genre that it pays a very valiant homage to. As with most westerns the plot line involves a quiet man that is down on his luck who is occupied only with the daily business of living. In our case the protagonist is Dan Evans, a farmer and crippled civil war veteran who is raising his family on a tract of land that has been prepared to be sold to the local railroad company without his consent or objection. In a horrible season of rampant drought he needs to grow an ample yield to free himself from his mounting debt and save his homestead. Dan Evans is also trying to maintain the structure of his family during this struggle. He is battling for position with his wife about being a proper man and breadwinner while trying to maintain his fatherly status amongst his children who are testing their limits to establish themselves as equals in their manhood. Dan had become crippled as a result of his service to the union army during the civil war and the circumstances under which he was injured are not revealed but they did result in him moving very far from his home. This is an interesting sub plot because it is not made clear to the viewer why his family has so much underlying content for his authority or being. The story clearly illustrates that Dan Evans is at the end of his moral fiber and is desperate to redeem himself and rescue his family from the bleak future that so closely awaits them. This plot line (and even sub plots) is highly typical of most western cinemas. These situations do a good job concrete the dire circumstances that may have been commonplace to a contemporary of this time. All these events set up the arrival of the hero’s salvation within the guise of the anti hero, who in this case is an outlaw murderer, Ben Wade. Ben wade is typical of this genres antagonist. He is very similar in many ways to the hero and they share many common thoughts and experiences but the antagonist just cannot accept any other way of life. The path to catharsis for our hero is clear and straightforward. In order to get redemption in the eyes of his family; the hero must face old fears, daunting odds, tough decisions and even the prospect of constant death to meet the challenge and win the life which he deserves. All of which can only be given by the hero’s counterpoint. The stories subplots are progressive and usually weave in and out of the destinies of the main characters. They (hero and antihero) both must deal with internal and external strife, moral struggles, deception from their respective camps and a growing fondness for the others character making their previous ways of life even more strained in the knowledge they conjure together. All of the minor characters have their storylines and always end up in the same manner. The good side often loses a very likeable and trustworthy character adding tension to the hero’s camp; while the bad side will battle amongst itself to satisfy its own lust for power which will usually bring about it own demise in the end. And while these new and exotic circumstances are unfolding, we the viewers are given some very familiar and relatable scenes to use to establish credibility and identity with the characters. Another important aspect of the genre is the eternal givings that have become the calling card of that type of film. These common thread experiences aim to give the viewer a familiar event to hold onto to help give the film a sense of credibility and fullness. In Westerns the stereotypical thoughts that arise are about but not limited to; steamy locomotives, ambushes, saloon scenes, gambling scenes, prostitutes, quick draw showdowns, expert horsemanship, and “trail life”. All of these segments are contained between the opening and closing credits of this movie but also within other movies. This creates a familiarity with the world the director is presenting to the viewer.